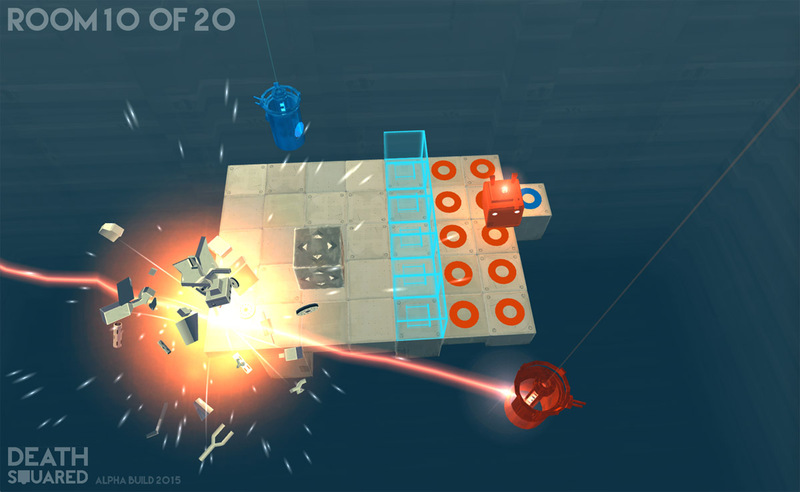 It was a somewhat lean year for co-op at PAX East 2016, but SMG Studio combated that trend with their upcoming game, Death Squared. SMG reached out to us and let us know they’d be thrilled if I could stop by and have a look at their indie puzzle game playable with up to 4-player co-op. I was more than happy to oblige. I swung by SMG Studio’s booth on Saturday and popped in just in time to grab a seat at the 2-player co-op demo. I didn’t know my co-op partner, but he seemed like a very nice guy with fortunately a large amount of patience (sadly, I forgot to catch his name). We played through a series of 10 rooms that got progressively more difficult, with me as the red robot and him as the blue robot. 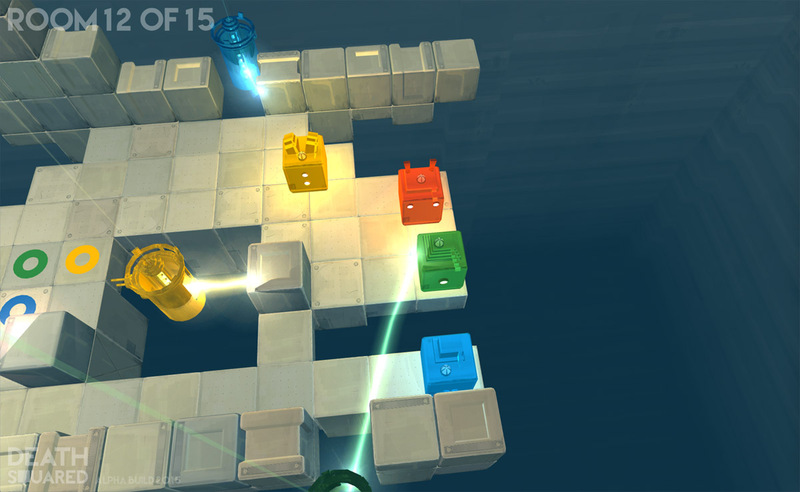 Various obstacles, such as lasers or blocks, were harmless to the same color-attuned robot, but would instantly kill the color-opposed robot. We had to communicate in order to carry out trust exercises (such as shielding each other from deadly lasers) so we could reach the ground panels of our color. When we had both touched our panels, we were able to complete the level and move on to the next one. We had to do all this while doing our best to not slip off the edges of the platforms (I fell to my death several times, I’ll admit). Most of the levels took at least a few attempts in order for us to figure out what was going on, then to puzzle out the best way to progress. In the end, we made it past the whole gauntlet of rooms in under 15 minutes. We commemorated our victory with a celebratory high-five. It was a really nice feeling to accomplish something like that with a complete stranger. By the time I was done, developer Ash Ringrose had returned from his on-stage commitment and was happy to chat about the game with me. Though I didn’t know much about Death Squared coming into the convention, he was happy to give me the game’s history and goals on the spot. Death Squared has been in development for about three months and I was quite impressed with what they had to show for being in development for so short a time. While the game can be played in single-player with one controller (the two robots are each controlled by a separate analog stick), the emphasis of the game is really on the co-op. There will be a 2-player co-op core story which focuses on the two robots (they’re AIs being tested) as well as 4-player co-op room gauntlets for party play. Ash told me that they wanted to design a game to make people talk to each other, which was exactly what I experienced in my time playing it. It would be extremely difficult to accomplish the tasks without communicating or pointing. It reminded me a lot of a charming game I played for review early on in my Co-Optimus career, ilomilo. If you liked that one, then Death Squared will probably be right up your alley. 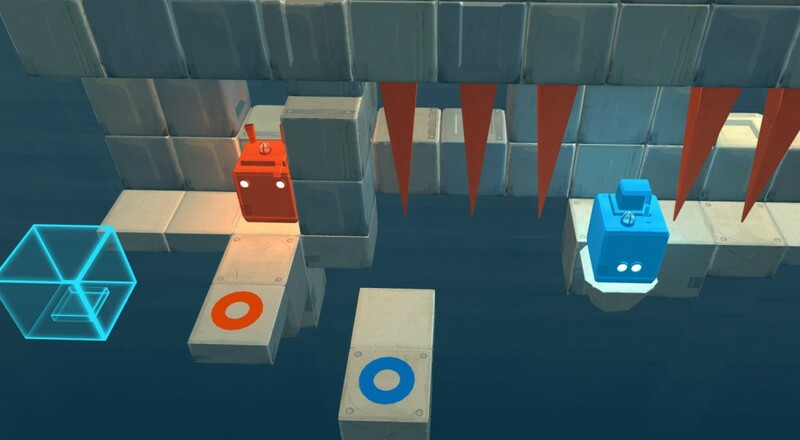 Death Squared will be coming out on Steam likely sometime this summer. Console versions are also in the works and are planned for a later date. The game will support 2-player and 4-player co-op modes. Below you can find a video of the game in action, which is really the best way to explain it. Page created in 1.1616 seconds.